The Round Table is large for a still life (about 5 feet tall) and decidedly top-heavy. When hung too high it looms over the viewer, but not in an aggressive way. 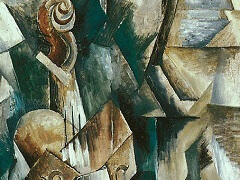 It's a cool, mellow painting, not hot and metamorphic like Picasso's works of the period. 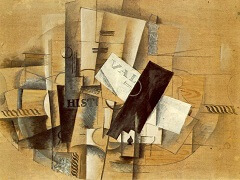 (If Picasso is a Spanish summer, Braque is a French fall-Stop it!) We might call it jazzy, but it's French jazzy, more Django Reinhardt than Louis Armstrong. Its soft, gentle color harmonies invite contemplation. We notice how various shades of brown, from light tan to rich chocolate, play off of one another and how the painting's only patch of cobalt blue is placed perfectly at the left edge of the table, where it both complements the background orange and sets the brown guitar off from the tabletop. 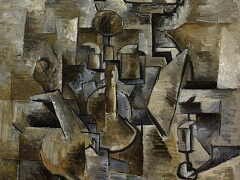 We also notice how the sand that Braque adds to his pigments gives the paint a rough, grainy, pitted texture that, spread across the entire canvas, emphasizes the flatness of the surface and is a constant reminder that the painted objects, for all their legibility and integrity, are an elaborately worked illusion. We look at these objects: a guitar, a pipe, a bottle, sheet music. The usual suspects. 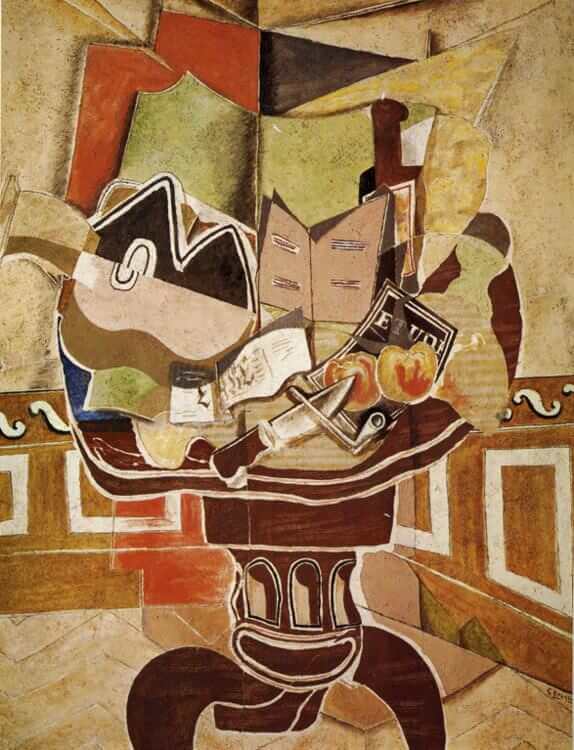 Braque has been playing variations on these themes for two decades now, and while this work lacks the in-your-face pictorial radicalism of his 1911 Pedestal Table, where a violin is represented by a fragmented field of signs that viewers must mentally combine into the concept 'violin,' long study shows me that The Round Table may be equally radical, but in a subtler, more insinuating way. Like all great still lifes, it is a work in which the simplest, most mundane objects are granted an astonishing complexity. The crucial modern difference here is that this complexity is found not in what the objects represent but in how that representation is accomplished. 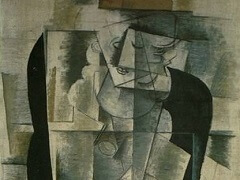 Every object in this painting can be seen to deconstruct itself, to reveal itself as a constructed illusion even as it perpetuates that illusion. Every single thing in the painting (and the painting as a whole) is both a pictorial representation and a deconstruction of representation. 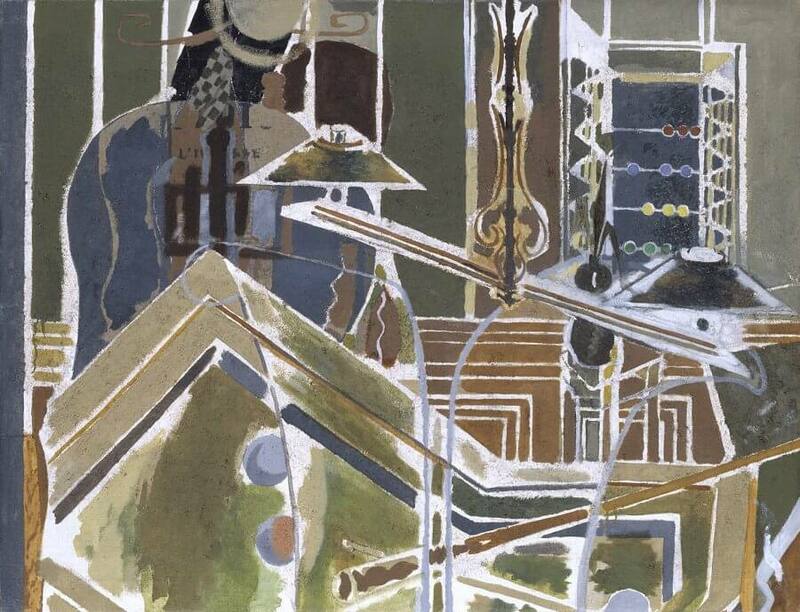 A work that abstracts recognizable forms while giving form to abstractions, The Round Table takes us deep into the paradoxes of painting. It shows us that space is flatness; that the more realistic an object looks, the more deceptive it is; that apparent solidity is actually flimsy enough to be rolled up like a scroll and stored with other canvases. 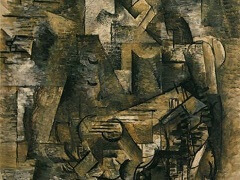 Braque toils in representation, a place where, by definition, illusion displaces reality, and he struggles not to deceive. Accordingly, he constructs his work in a way that transparently lies, that is obviously impossible. He knows that the only truthful representation is one that deconstructs itself, turns itself inside out and shows us the gears and wires inside, the flatness and paint under the illusion of space and objects. 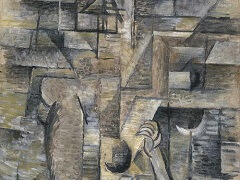 And yet as long as Braque paints objects (and he has no desire to make abstract pictures), he remains caught up in the most basic pictorial deception. This pipe is not a pipe (as Rene Magritte would say); this guitar is not a guitar. 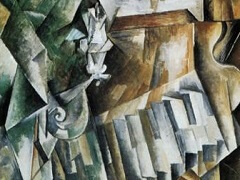 The only way to approach the truth in painting, it seems, is to build your work out of an assortment of bald-faced lies, untruths so unsubtle that the attentive viewer can only see the deception, know himself deceived, and ask why, eventually penetrating to the true heart of pictorial falsehood. The Round Table is truthful only because it cannot be believed.